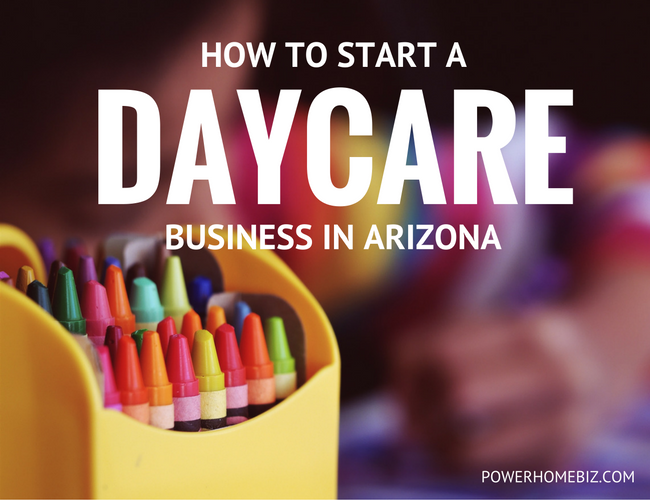 Do I need a license to operate a daycare or child care business in Arizona? You are required to get a license and pass the child care group home certification requirements if you will provide child care with compensation for 5 or more children in your home. You do NOT need a license if you will only care for 4 or fewer children for compensation with all of your own children. Where do I get information about licensing a daycare or child care business in my state? What are the requirements to get a license for my daycare business? If applicable, contact the County Health Department for kitchen plan review. Where can I get the application form to get a license? How much do I need to pay to get a license for my daycare business? Can I get a grant from my state for my daycare business? Contact the Bureau of Child Care Licensing if there are grant monies available for child care providers. What are the insurance requirements for getting a daycare license in Arizona? According to the Arizona-based insurance company Mohave Insurance Center, Inc., the General Liability requirements for a daycare in Arizona are $1,000,000 per occurrence liability limit with a $2,000,000 aggregate limit. The State also wants a minimum of $50,000 of Damage to Rented Premises Rented to You. Another important note is Abuse and Molestation coverage. Arizona recently increased the required limit for Abuse and Molestation coverage to $500,000. Also, any Certificate of Liability issued to Arizona must say, “Sexual Abuse/Molestation is included” in the comments section. Finally, the State of Arizona wants to be listed as an additional insured. Make sure to ask for this, because it is often a separate endorsement and will usually cost more. Seek your local insurance agent for advice if you have any questions. What other things do I need to know about operating a daycare business in my state? There is a staffing requirement of 1 staff member to 1 to 5 children or 2 staff members to 6 to 10 children, excluding your own children, at all times and not have more than 15 total children including your own children at any time. Your home must meet the square footage requirements for indoor space – e.g. 30 square feet per child, not including areas such as kitchen, bathroom, laundry room, workshop, hallway, and garage, etc. Your home must have a direct exit to the outside on each floor/level. Infants and children under the age of 5 years cannot be cared for above or below the ground level of the home unless there is a direct exit to the outside on that level. You must provide an outdoor play area that is partially shaded and enclosed by a fence that is at least 4 feet high with a gate that has a latch. If you have a swimming pool, it must be separately fenced with at least a 5-foot high fence that has a self-closing, self-latching gate with a lock. You must be willing to secure and maintain general commercial liability insurance. All personnel and household members who are 18 years of age and older must submit fingerprints for a criminal history check. NOTE: To ensure compliance with the requirements imposed by the state, please contact the licensing agency directly for the most recent and accurate rules governing daycare or child care business licensing in your state.